During its 50 years of existence, the nuclear power industry has accumulated vast amounts of various types of radioactive waste. New technology will remain in high demand in India due to its plan to set up 25 nuclear plants. Russian scientists have been working for several years already trying to develop a new method for the processing of nuclear power plant waste. Until now, the main method for disposing low-level and intermediate-level radioactive waste was vitrification in a direct electric heating furnace. This method is also being used in India at the radiochemical plants in Tarapur and Trombay. This new technology works on the principle of processing liquid waste in a salt concentrate and using deep evaporation units capable of attaining temperatures of 1800 ºC. The hot molten salt concentrate is then poured into metal barrels, which after cooling, turns into a glass-like monolith. “Plasma technology allows converting radioactive waste into glass-like slag, and in the process, greatly reducing its volume, and then afterwards, this slag is easily shipped for very long and safe-for-humans storage,” explains Alexander Uvarov, a nuclear energy expert. Such installations, he said, are relatively cheap, including when it comes to operating them, while also requiring a minimal presence of staff in the most dangerous sections. One thousand tonnes of radioactive water, after processing, is transformed into a single packed barrel. In such a sate, the cooled salt concentrate can be stored for up to 300 years. During this period, the majority of radioactive isotopes remain safe, while the barrels themselves can be stored in conventional hangars. 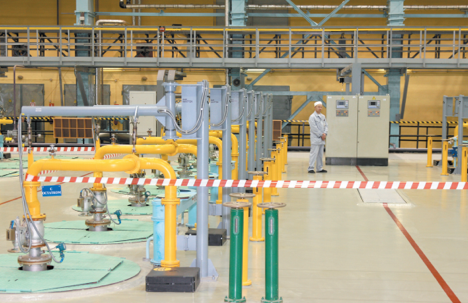 They decided to try out this new complex at the Novovoronezh NPP, since this was one of the first commercial nuclear power plants in the USSR. It has been operating since 1964, and during this time, a great quantity of waste has accumulated in the station’s storage facilities. Some nuclear-power states are trying to send their waste to poorer countries, which are in dire need of foreign currency. For example, Europe usually sends low-level radioactive waste into Africa. Worldwide, the number of new nuclear power plants, research reactors, and atomic installations in general, keep growing every year, and accordingly, the amount of hazardous waste keeps increasing. In India, for example, nuclear power plants will produce 14.6 GWh of electricity by 2020, while the authorities intend to get one quarter of the country’s electricity from nuclear power plants by 2050. Moreover, Russia may be involved in building up to 25 nuclear power plants in India. All of this means that technologies for the processing of radioactive waste and spent fuel will remain in high demand in India in the coming years. Some countries, involved in the development of the nuclear power industry, do not recycle its waste products, choosing to bury them deep underground in special containers. “The methods of waste incineration that are available in the world today have almost exhausted their environmental and technological usefulness, in addition to being very expensive to use. Improving the effective utilisation of waste processing technologies, including the use of plasma, will remain a priority for Russian nuclear scientists,” says Uvarov. According to him, after the successful operation of this complex at the Novovoronezh NPP, Russia can begin offering it in the international market. In the future, the Russian state corporation Rosatom is planning to equip as many nuclear power plants as possible in Russia with such plasma installations. In the end, thanks to this new technology, first, the need for transporting dangerous waste will disappear, and second, thousands of cubic meters will be freed up in warehouses that currently store radioactive waste. At one time, the US Environmental Protection Agency called vitrification the best technology for the management of radioactive waste.